I am the proud owner of a Champion Performance Donkey. I’m extra proud of this because I trained him to be a very-useful-donkey-indeed all by myself! I don’t really have one. Probably derivations of Debra but definitely not Debbie – it’s just not me. Plummeting from a height – I’m not good on planes or in elevators! I don’t have a style just yet – I enjoy experimenting. Curious, enthusiastic, energetic, persistent, considered. It would have to be a year and a place – somewhere in the Regency period in England – with Jane Austin as my ‘bestie’. I love the surface civility and manners of this era, and the mindfulness with which tasks were undertaken, the slowness of life. I don’t know if I could live there, though given the sexual and social inequalities (unless I was independently wealthy or married very well !) but Jane Austin did have a donkey – so that might make it all worthwhile! My greatest influence in life, I reckon is my mum – even though she’s dead, I’m sure I’m influenced by being her daughter in million ways each day. And that has to influence my writing. Also my kids – the primal chain is overwhelmingly powerful- isn’t it?! We influence each other. I feel like I’ve neglected my husband, but I think he is more my greatest source of strength and encouragement than influence – if that makes sense? Discombobulated. I love the sound and the picture it makes in my head of confusion. It is just a perfect word. The Bible –It’s so long that it will take me the rest of my life to read it (I am a slow reader!) It also has a narrative diversity to ponder and the ability to speak into people’s lives. PLUS – it’s a donkey lover’s delight – donkeys are front and centre in the main action. 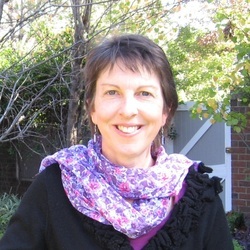 Debra Tidball is an Australian children's author. 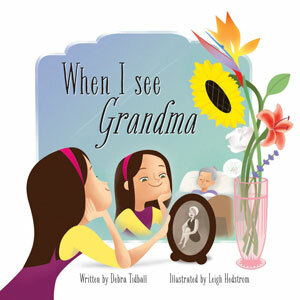 Her picture book When I See Grandma (illustrated by Leigh Hedstrom and published by Wombat Books) sensitively deals with the topic of dementia. Visit Debra's website and Facebook page for more information about her books and writing.